All The Boldest Cosplay From Star Trek Las Vegas 2014! Nobody parties like Star Trek fans. And with nearly 50 years of rich storytelling to choose from, there's no cosplay as clever and far-ranging as Star Trek cosplay. This past weekend, Star Trek Las Vegas played host to some of the best cosplayers in this quadrant, and Jordan Hoffman was there. In addition to taking the astounding photos you see below, Hoffman also hosted four sessions of One Trek Mind Live, which he calls "live listicle panels/screaming matches" that result in terrific top 10 lists. This time around, they decided the 10 biggest jerks in Star Trek, the best catch-phrases, the best Klingons, and the best post-Trek roles. 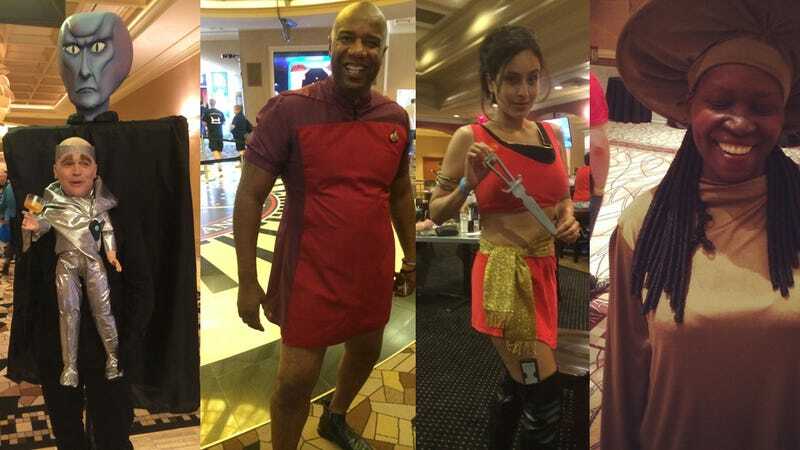 Behold the amazing cosplay of Star Trek Las Vegas — can you identify all of these? All photos via Jordan Hoffman. Follow him on Twitter!